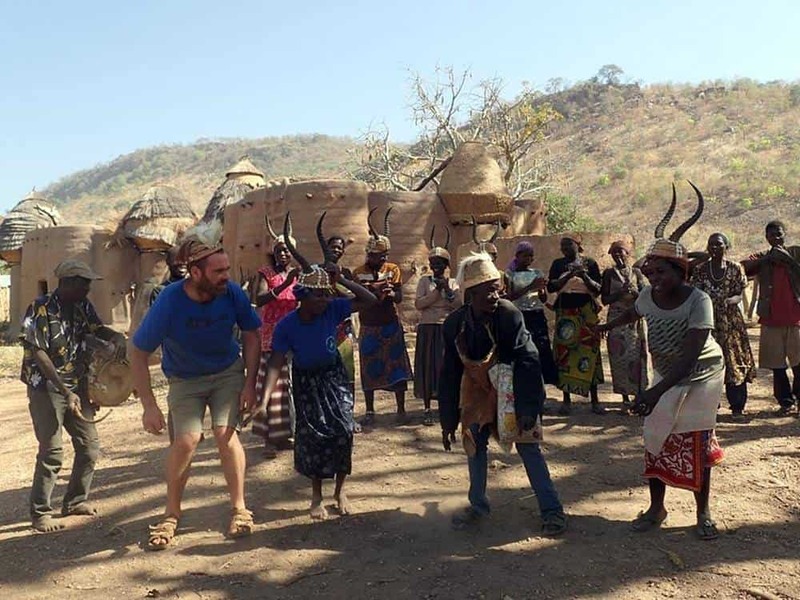 A 28 day trip that starts and finished in Accra, Ghana Experience incredible West African culture, traditional architecture, voodoo ceremonies, slave history, music, beaches and wildlife on this off the beaten track adventure! IMPORTANT: Due to the ongoing security situation in Burkina Faso, we have made the difficult decision to no longer visit this country. Whilst we hope the situation will improve soon there is no indication of when it will be ‘safe’ enough again for overland travel. Please note we will be updating the information and documents below over the next few weeks. Please check back in to see the revised map & itinerary soon. Though this is our shortest trip in terms of the distance covered, the roads in places are a mixture of broken tar and dirt – so we have built extra time into the itinerary in case we are slowed down. We like to explore as much as possible and try and visit a number of places that there simply is little or no up to date information about. As a result, some patience will be needed when the trip arrives at a new place (i.e. finding somewhere to camp or sourcing a guide to show us around). 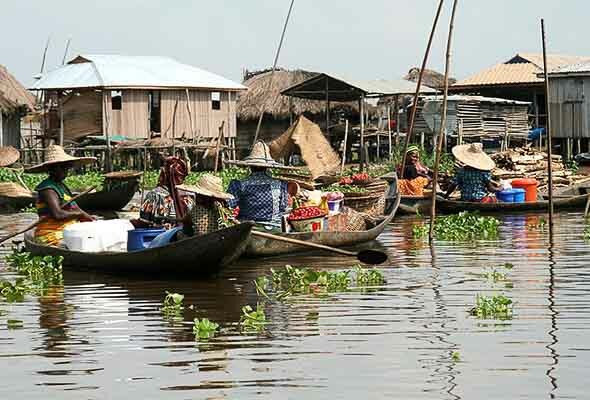 Ghana, Togo, Benin and Burkina Faso are all relatively speaking used to travellers and tourists, so we do not expect any significant challenges on this trip. However, despite being a relatively well travelled part of West Africa, it is still a more challenging area to travel in than other more ‘touristy’ parts of Africa. Therefore we strongly advise you to read our What to Expect page before booking this trip. The trip starts in the Ghanaian capital Accra where we’ll obtain visas for later on in the trip. Whilst here you could explore the famous fishing harbour, lighthouse, colonial fort in historic Jamestown or take a guided tour of one of Accra’s impoverished yet vibrant neighbourhoods. It’s well worth visiting the world-famous coffin makers just outside of the city, where men chisel timber into all kinds of objects to give people a final send off in style (cars, animals, rockets, you name it!) In addition, the artisans market has a superb array of masks, statues, clothing, jewellery, chess boards and chairs for sale if you feel the urge for some early-on souvenir hunting! With visas in hand we’ll drive north east to the stunning Lake Volta region. Arguably the most picturesque part of Ghana, we’ll base ourselves near the town of Amedzofe for a chance to explore the surrounding countryside. We’ll leave it up to you to decide what you want to do on the free day, but some highlights include the chance to climb Mount Gemi, trek to Ote Waterfalls, visit a sacred monkey sanctuary, watch Kente cloth weavers at work or simply kick back and relax taking in the views of Lake Volta. From Ghana we head east and cross into Togo, the second country on this trip. A beautiful drive brings us into the town of Kpalime, nestled in the mountains near the Ghanaian border. 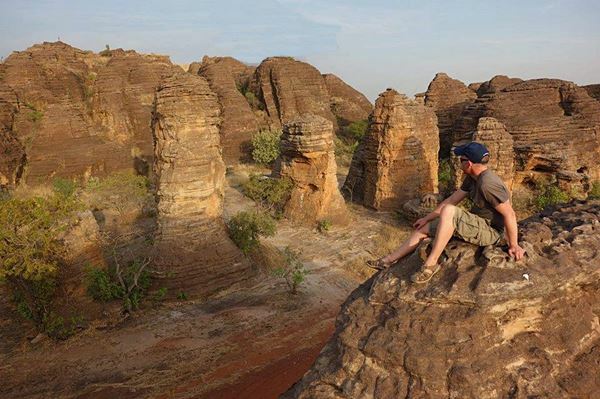 We’ll base ourselves close to Mount Klouto, which on a clear day offers great views of Mount Agou, Togo’s highest peak. The surrounding area is a protected nature reserve and home to countless butterflies as well as unique flora and fauna. Here you’ll have the opportunity to go hiking in the mountains for the day, and if you fancy it there are numerous waterfalls in the vicinity allowing for a refreshing dip after a day out hiking! You could also visit the bustling market in Kpalime, drawing fruit sellers from far and wide, or you could swing by the artisan centre to see the crafts people at work with the chance to buy their wooden sculptures, masks, pottery and batik. From Kpalime, we’ll drive south to the coast to visit Lome, the capital of Togo. 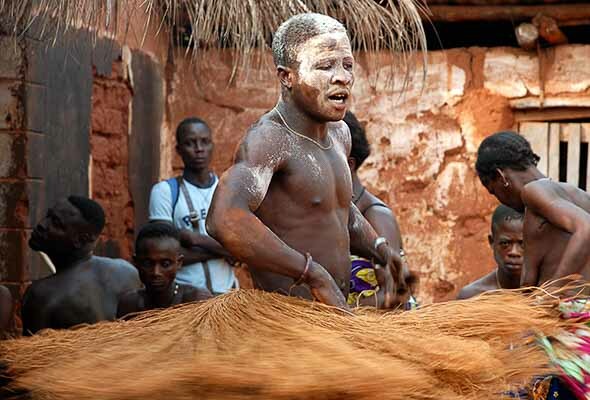 Voodoo and fetishes are integral to Togolese beliefs and culture, and the Akodessewa fetish market in Lome is believed to be the largest in the world with all manner of traditional ingredients and fetishes on offer. Here you’ll find piles of heads, limbs, skins, bones and teeth, making for a grizzly but fascinating sensory experience. While it can be upsetting to see various protected species for sale, this market is a must see for gaining an insight into the local culture. 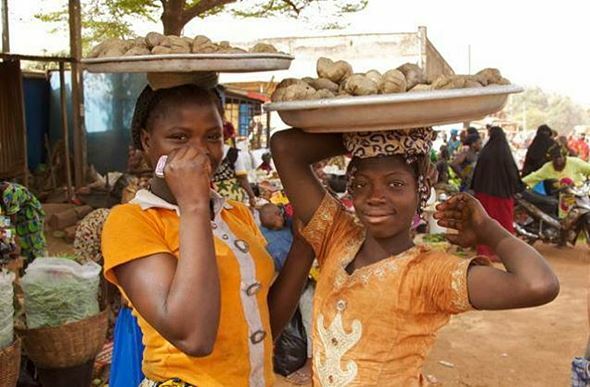 Other sites in Lome include the vast and colourful indoor market overflowing into the surrounding streets. This is home of the ‘Mama Benz‘, women who made their riches selling wax cloth and named after their car of choice. It is the place to buy wax cloth, although almost everything imaginable can be found! The border town of Hilla Condji on the coast between Togo and Benin is the main crossing between the two countries, and can be very busy, so expect to spend a few hours completing formalities. Our first stop is the city of Cotonou, the capital of Benin in everything but name (the official title goes to Porto Novo). We’ll spend a few hours in the city to apply for visas (if necessary), offering you the chance to visit the famous Grand Marche of Dantokpa, one of the most impressive in all of West Africa. You’ll need your wits about you as you navigate your way around the tightly packed stalls and the hive of activity that comes with such a huge bustling market place! 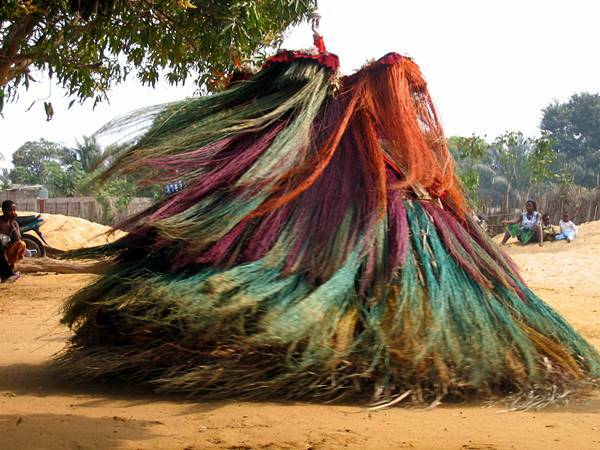 One of the most intriguing places to visit in Cotonou is the Fetish section within the Grand Marche of Dantokpa. Dozens of stalls display a mixture of animal parts that are used for everything from treating disease to enhancing a particular skill to warding off evil spirits. You could also visit the highly regarded and world famous Fondation Zinsou museum, promoting some incredible contemporary African art. From Cotonou a short drive west brings us to the beautiful beach at Grand Popo. 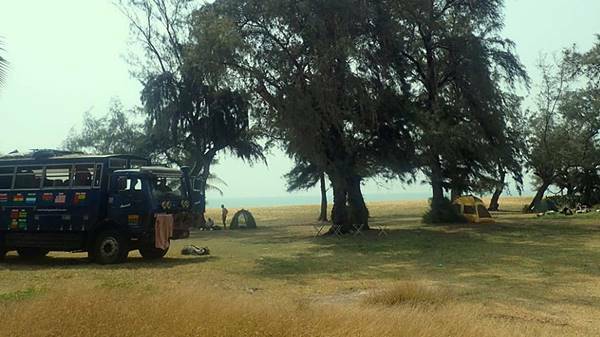 We’ll spend 2 nights at this tranquil spot, camping right on the seafront in the grounds of the old colonial customs building. A great chance for some R&R! With a bit of luck there will be the chance to go on a guided walk along the beach to watch the turtles hatching and scurrying off into the ocean. You could take a boat trip to visit fishing villages, see salt being processed on the Mono River, or visit Bouche du Roi, a beautiful spot where the river meets the ocean. There is also the option to go and watch a spectacular whirling dervishes voodoo ceremony not far from Grand Popo, where you’ll spend an incredible couple of hours listening to hypnotic music and dancing, all topped off with colourful dervishes kicking up the dust! From Grand Popo a short drive along the coast brings us to the town of Oudiah, widely considered the spiritual home of Voodoo. Originally known as Glewe during the reign of the Xweda kingdom, Ouidah later came under the control of the Dahomey kingdom. As the Portuguese, French, Danish, Dutch and British all gained a foothold along the Gulf of Guinea, Ouidah became one of the most significant centres of the appalling slave trade that blighted West Africa for so many years. It’s estimated around one million slaves were shipped from Ouidah to Brazil and the Caribbean between the 1600’s and 1800’s. A truly tragic history. 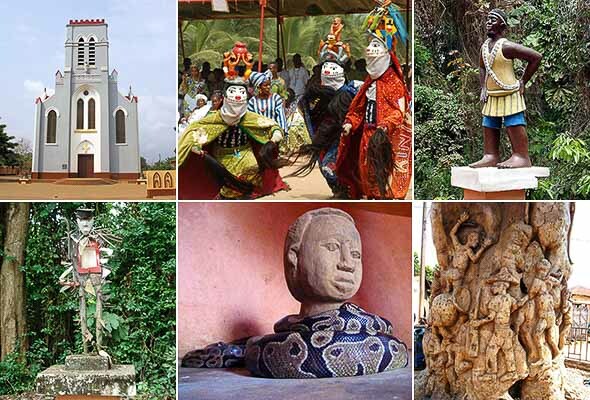 There are many sights to see in Ouidah, including the Temple of Pythons, Fort of São João Baptista de Ajudá, the Basilica of the Immaculate Conception, numerous monuments and temples in the Sacred Forest of Kpasse and the Caso Do Brazil. After visiting the sights in the town, we will drive down to the seafront along a road known as “La Route des Esclaves” (route of slaves). This road is lined with statues and monuments relating to both the slave history and voodoo traditions of Ouidah. The road ends on the beach where there is a large memorial built in remembrance of all those who were sold as slaves and forced onto the waiting ships to never see their homeland again. This monument represents the ‘Point Of No Return’ and is surrounded by a number of statues of people in shackles. There is another monument close by called the ‘Gate of Salvation’ dedicated to the catholic missionaries who first arrived in Dahomey. As with all places we visit on our trips, we are guests in other people’s surroundings, so it’s always polite to ask to take photos rather than just pointing a camera at people and their homes. The trip continues as we drive north to the town of Abomey, the old capital of the Dahomey Kingdom. The town prospered between the 16-1800’s under a succession of powerful kings who built impressive Royal Palaces and walled fortifications. Much of Abomey was destroyed when the French attacked the town in the late 1800’s, but fortunately a decent amount has been rebuilt and preserved. The palaces have been designated a UNESCO World Heritage Site since 1985. 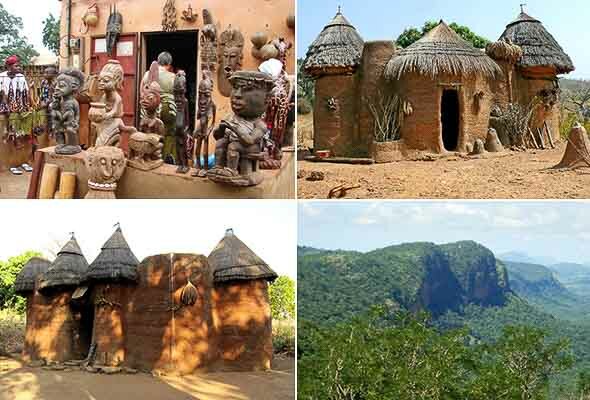 We’ll have a free day in Abomey for a chance to visit the numerous sites of the old kingdom, including the royal compound, numerous palaces, temples and fetish shrines. 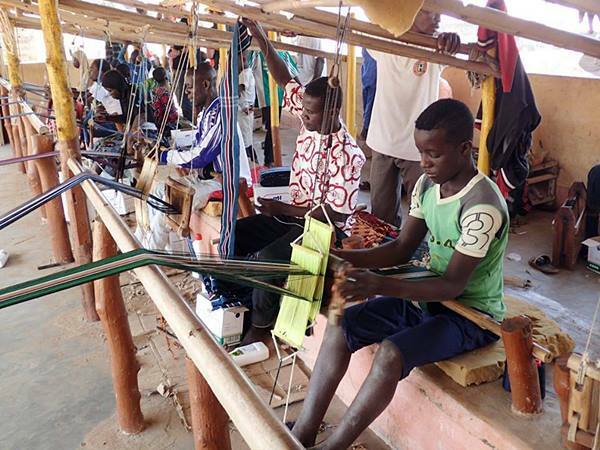 There is also the opportunity to visit the artisans at work in and around Abomey, making everything from metal work and wood work to weaving and textiles. 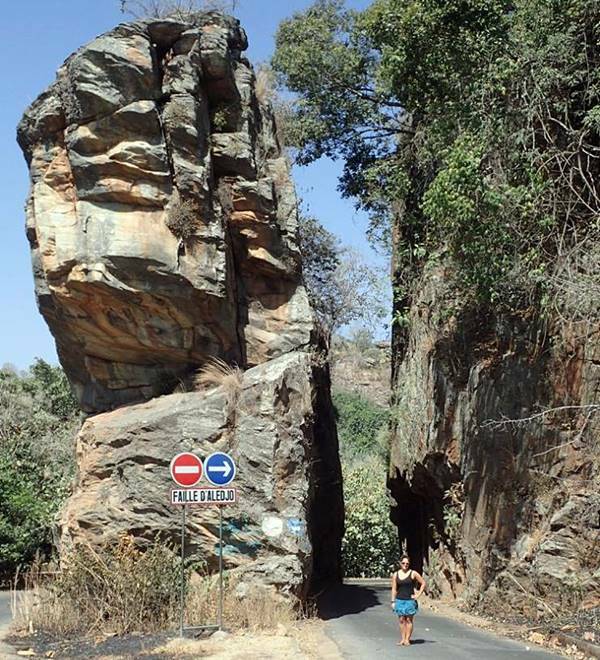 From here we’ll cross back into Togo, heading north to the iconic Aledjo Fault – an incredible sight which the road we will be driving along passes through. We will stop at an artisanal co-operative to see cloth weavers at work, and visit a traditional blacksmiths village that was the birthplace of long standing former president, General Eyadéma Gnassingbé. At his time of death Eyadéma was the longest serving president in Africa. Heading further north we arrive in the Tamberma Valley to see the UNESCO World Heritage listed region of Koutammakou. 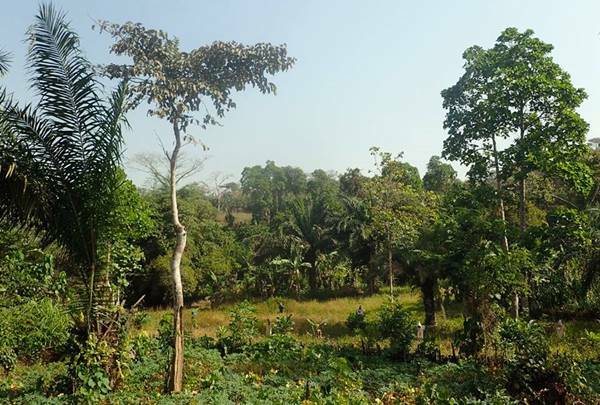 We’ll spend several days in this area which straddles the Togo-Benin border, with the chance to visit the villages of the Batammariba people in Togo. The Batammariba live in mud ‘tower-houses’ known as ‘Takienta’, which make for an impressive sight against the surrounding landscape. 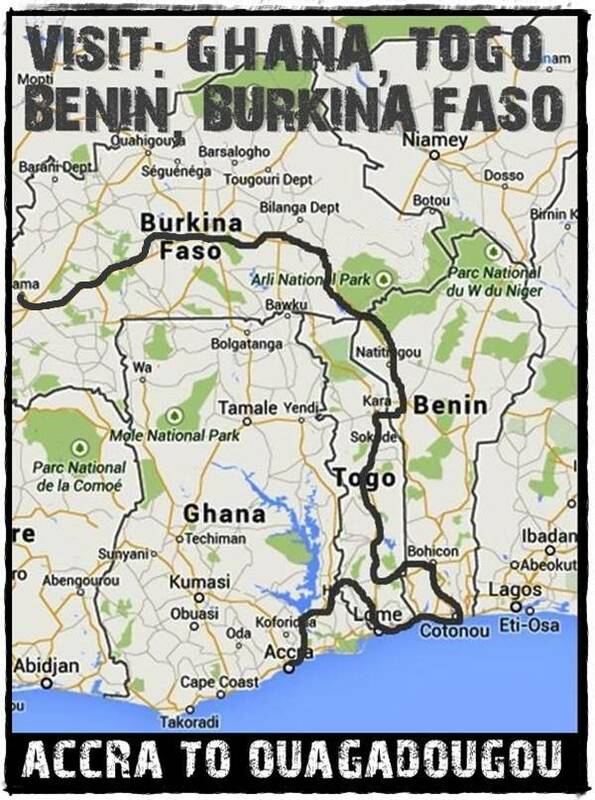 Next we’ll journey across the border back into Benin and the area around Koussoukoingu in the Atakora Hills. Here we’ll visit the villages of the Tammari people, also known as Somba, which roughly translates as ‘good masons’. 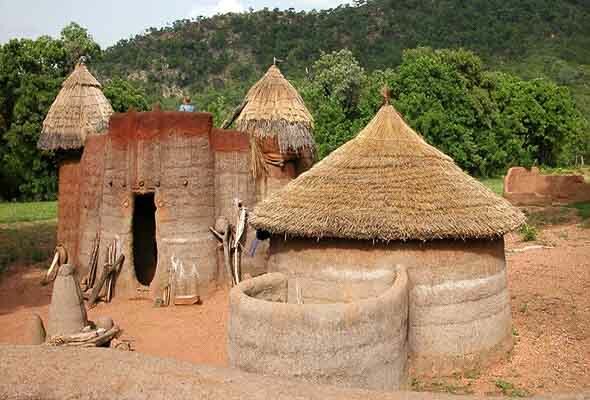 The traditional Somba homes are constructed from clay, wood and straw. Many of the homes are two storeys high with a grain storage area on the upper level. The doors open to the west as the Somba believe life comes from this direction. Their houses are fortified dwelllings, built to guard against slave raiders from the Dahomey Empire in the 17th century, Germans in the 19th century as well as slave raiders from North Africa. 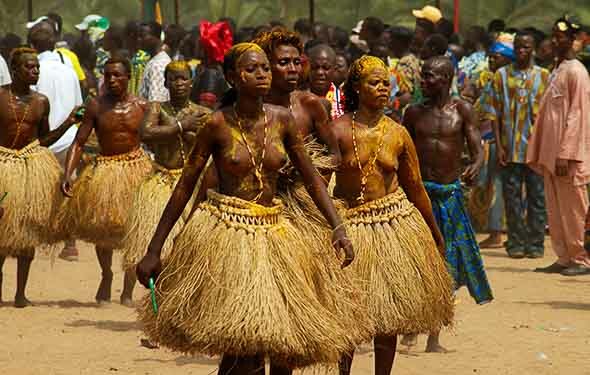 To this day many of the Tammari remain animists. Our next stop is Pendjari National Park, considered one of the best reserves in all of West Africa for spotting wildlife. This park, combined with W National Park in Niger and Arli National Park in Burkina Faso forms part of the W.A.P complex. Together they form the largest contiguous protected natural area in West Africa. 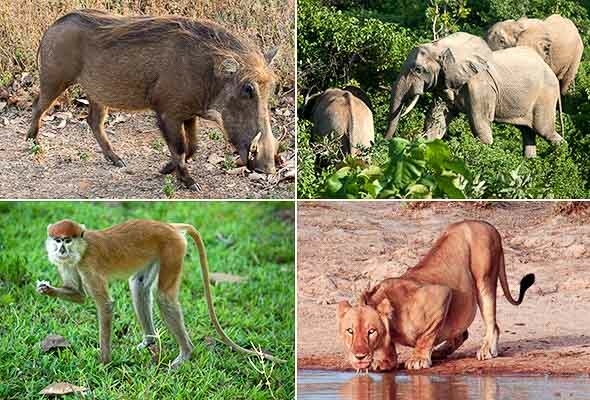 Most big animals have been hunted to extinction throughout much of West Africa, but Pendjari retains a decent amount including elephants, hippos, various antelopes, plenty of birdlife, warthogs, baboons and also Lions! We’ll have a free day for wildlife safaris in the park for the chance to see some of the wildlife. Pendjari is dominated in places by a series of hills known as the Atakora range, forming a dramatic backdrop in this beautiful area. With luck there’ll be a chance to cool off under the refreshing waterfall not far from the camp site we’ll base ourselves at in the park! Our journey continues as we cross into eastern Burkina Faso. Due to security considerations we won’t spend much time in this part of the country, so will instead drive for a couple of days across the country to the Banfora region. 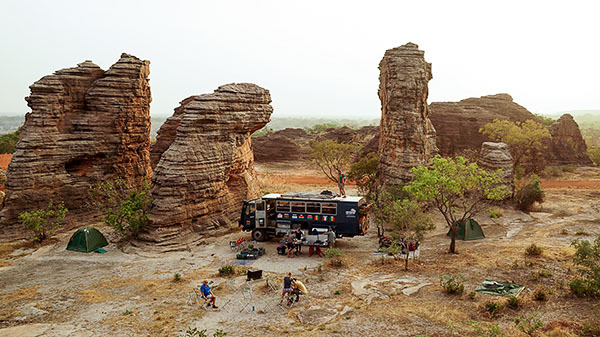 This is perhaps the most beautiful part of Burkina Faso where we’ll take the time to explore this stunning area. With so many options on offer we will leave it for you to decide what you want to do when we get to the Banfora region. From here we’ll spend a night or two in funky Bobo Dioulasso, the second city of Burkina Faso and home to the Sudanese style grand adobe mosque and a superb market, not to mention some great nightclubs. Time permitting you could also visit nearby villages like Koumi and Koro famed for their mud architecture. The trips finishes in the capital city of Ouagadougou, where we’ll camp within the grounds of a hotel on the outskirts of the city. 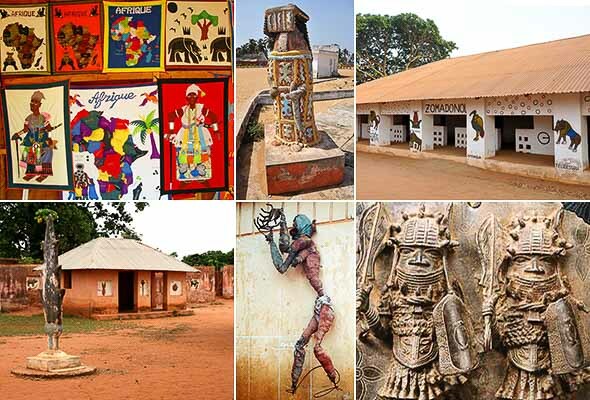 There are some fantastic museums and music workshops in Ouaga, offering you a great chance to throw yourself into the musical and cultural scene! You could also take a taxi ride out of the city to the Laongo Sculpture Park. Since the late 1980’s, local artists have sculpted all manner of objects from the surrounding granite formations, creating a landscape dominated by everything from tribal people to animals to historical scenes. 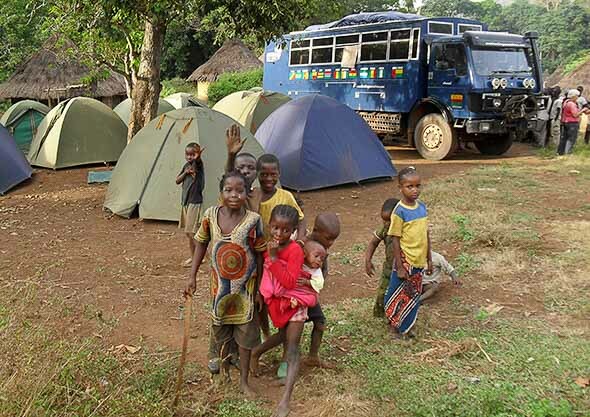 Please note: This trip can be combined with our Dakar to Freetown trip and/or our Freetown to Accra trip to make the ultimate West Africa Overland Adventure!